What are you doing? Twitter, a product created by the Odeo team, is a microblog social networking site aimed at finding an answer to that very question. After seeing Twitter a few weeks ago and wondering why I would ever want to give people a constant flow of Frank Gruber updates I decided to finally do a more thoroughly examination. I started sending messages and found that there are lots of my friends and blogosphere colleagues using the product. I found utility in the fact I can subscribe to a feed of all my friends to stay connected. Though Twitter offers SMS alerts of your friends updates I decided to opt-out of that option as I already receive enough SMS alerts as it is. Nonetheless, I think Twitter offers a good way to stay in the loop with your friends. Due to its laid back, instant messaging feel, I would caution users about what gets posted to Twitter, as it is going to be on the Internet for all to see. It appears Twitter has had some problems with its rapid growth as it has been struggling through some performance issues. 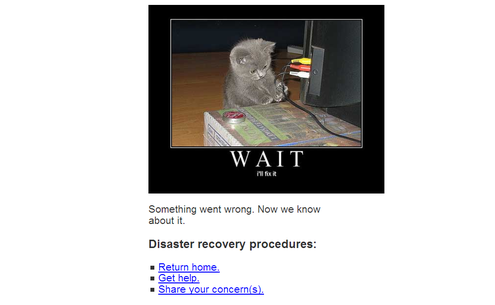 At least they are having fun with it, as it recenlty offered up the error page below. Drop in and leave me an update, what are you doing?